Swedes ( Swedish: svenskar) are a North Germanic ethnic group native to Sweden. They mostly inhabit Sweden and the other Nordic countries, in particular Finland, with a substantial diaspora in other countries, especially the United States. Sweden enters proto-history with the Germania of Tacitus in 98 AD. In Germania 44, 45 he mentions the Swedes ( Suiones) as a powerful tribe (distinguished not merely for their arms and men, but for their powerful fleets) with ships that had a prow in both ends ( longships). Which kings (kuningaz) ruled these Suiones is unknown, but Norse mythology presents a long line of legendary and semi-legendary kings going back to the last centuries BC. As for literacy in Sweden itself, the runic script was in use among the south Scandinavian elite by at least the 2nd century AD, but all that has survived from the Roman Period is curt inscriptions on artefacts, mainly of male names, demonstrating that the people of south Scandinavia spoke Proto-Norse at the time, a language ancestral to Swedish and other North Germanic languages. In the 6th century Jordanes named two tribes, which he calls the Suehans and the Suetidi, who lived in Scandza. These two names are both considered[ by whom?] to refer to the same tribe. The Suehans, he says, has very fine horses just as the Thyringi tribe (alia vero gens ibi moratur Suehans, quae velud Thyringi equis utuntur eximiis). The Icelander Snorri Sturluson (1179–1241) wrote of the 6th-century Swedish king Adils (Eadgils) that he had the finest horses of his days. The Suehans supplied black fox-skins for the Roman market. Then Jordanes names the Suetidi which is considered to be the Latin form of Svitjod. He writes that the Suetidi are the tallest of men—together with the Dani, who were of the same stock. Later he mentions other Scandinavian tribes as being of the same height. In the 14th century, Sweden was struck by the Black Death. The population of Sweden was decimated. During this period the Swedish cities also began to acquire greater rights and were strongly influenced by German merchants of the Hanseatic League, active especially at Visby. In 1319, Sweden and Norway were united under King Magnus Eriksson, and in 1397 Queen Margaret I of Denmark effected the personal union of Sweden, Norway, and Denmark through the Kalmar Union. However, Margaret's successors, whose rule was also centred in Denmark, were unable to control the Swedish nobility. However, the Swedes began to resent the monopoly trading position of the Hansa (mostly German citizens) and to resent the income they felt they lost to the Hansa. Consequently, when Gustav Vasa or Gustav I broke the monopoly power of the Hanseatic League he was regarded as a hero to the Swedish people. History now views Gustav I as the father of the modern Swedish nation. The foundations laid by Gustav would take time to develop. Furthermore, when Sweden did develop and freed itself from the Hanseatic League and entered its golden era, the fact that the peasantry had traditionally been free meant that more of the economic benefits flowed back to them rather than going to a feudal landowning class. This was not the case in other countries of Europe like Poland where the peasantry was still bound by serfdom and a strong feudalistic land owning system. Many looked towards America for a better life during this time. It is believed that between 1850 and 1910 more than one million Swedes moved to the United States. In the early 20th century, more Swedes lived in Chicago than in Gothenburg (Sweden's second largest city). Most Swedish immigrants moved to the Midwestern United States, with a large population in Minnesota, with a few others moving to other parts of the United States and Canada. Strong grassroots movements sprung up in Sweden during the latter half of the 19th century ( trade unions, temperance groups, and independent religious groups), creating a strong foundation of democratic principles. In 1889 The Swedish Social Democratic Party was founded. These movements precipitated Sweden's migration into a modern parliamentary democracy, achieved by the time of World War I. As the Industrial Revolution progressed during the 20th century, people gradually began moving into cities to work in factories and became involved in socialist unions. A communist revolution was avoided in 1917, following the re-introduction of parliamentarism, and the country saw comprehensive democratic reforms under the joint Liberal-Social Democrat cabinet of Nils Edén and Hjalmar Branting, with universal and equal suffrage to both houses of parliament enacted for men in 1918 and for women in 1919. The reforms were widely accepted by King Gustaf V, who had previously ousted Karl Staaff's elected Liberal government in the Courtyard Crisis because of differences in defence policy. It is possible that the Monarchy of Sweden survived because of the breakout of World War One, which saw a major shift in public sentiment towards the king's more pro-military views. Sweden remained officially neutral during World War I and World War II, although its neutrality during World War II has been disputed. Sweden was under German influence for much of the war, as ties to the rest of the world were cut off through blockades. The Swedish government felt that it was in no position to openly contest Germany,  and therefore made some concessions. Sweden also supplied steel and machined parts to Germany throughout the war. However, Sweden supported Norwegian resistance, and in 1943 helped rescue Danish Jews from deportation to Nazi concentration camps. Sweden also supported Finland in the Winter War and the Continuation War with volunteers and materiel. Sweden remains non-aligned militarily, although it participates in some joint military exercises with NATO and some other countries, in addition to extensive cooperation with other European countries in the area of defence technology and defence industry. Among others, Swedish companies export weapons that are used by the American military in Iraq. Sweden also has a long history of participating in international military operations, including most recently, Afghanistan, where Swedish troops are under NATO command, and in EU sponsored peacekeeping operations in Kosovo, Bosnia and Herzegovina, and Cyprus. Sweden held the chair of the European Union from 1 July to 31 December 2009. 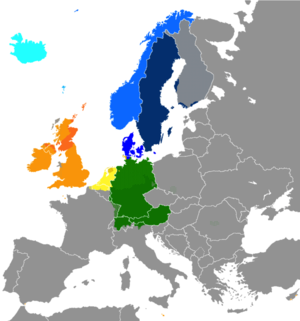 The native language of nearly all Swedes is Swedish ( svenska ( help· info)) a North Germanic language, spoken by approximately 10 million people,  predominantly in Sweden and parts of Finland, especially along its coast and on the Åland islands. It is, to a considerable extent, mutually intelligible with Norwegian and to a lesser extent with Danish (see especially " Classification"). Along with the other North Germanic languages, Swedish is a descendant of Old Norse, the common language of the Germanic peoples living in Scandinavia during the Viking Era. It is the largest of the North Germanic languages by numbers of speakers. According to recent genetic analysis, both mtDNA and Y chromosome polymorphisms showed a noticeable genetic affinity between Swedes and other Germanic ethnic groups. 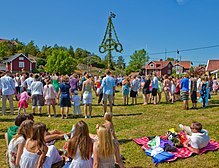 For the global genetic make-up of the Swedish people and other peoples, see  and . 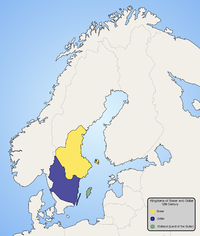 The largest area inhabited by Swedes, as well as the earliest known original area inhabited by their linguistic ancestors, is in the country of Sweden, situated on the eastern side of the Scandinavian Peninsula and the islands adjacent to it, situated west of the Baltic Sea in northern Europe. 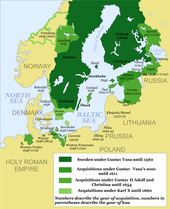 The Swedish-speaking people living in near-coastal areas on the north-eastern and eastern side of the Baltic Sea also have a long history of continuous settlement, which in some of these areas possibly started about a millennium ago[ citation needed]. 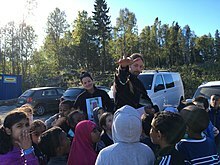 These people include the Swedish-speakers in mainland Finland – speaking Swedish dialect commonly referred as Finland Swedish (finlandssvenska which is part of East-Swedish dialect group) and the almost exclusively Swedish-speaking population of the Åland Islands speaking in a manner closer to the adjacent dialects in Sweden than to adjacent dialects of Finland Swedish. Estonia also had an important Swedish minority which persisted for about 650 years on the coast and isles. Smaller groups of historical descendants of 18th–20th-century Swedish emigrants who still retain varying aspects of Swedish identity to this day can be found in the Americas (especially Minnesota and Wisconsin, see Swedish Americans) and in Ukraine. Historically, the Kingdom of Sweden has been much larger than nowadays, especially during "The Era of Great Power" ( Swedish Empire) in 1611–1718. Finland belonged to Sweden until 1809. Since there was no separate Finnish nationality at those times, it is not unusual that sources predating 1809 refer both to Swedes and Finns as "Swedes". This is particularly the case with New Sweden, where some of the Swedish settlers were of Finnish origin. ^ "United Nations Population Division | Department of Economic and Social Affairs". un.org. Retrieved 2018-10-15. ^ "2000. Aasta rahva ja eluruumide loendus (Population and Housing Census)" (PDF) (in Estonian and English). 2. Statistikaamet (Statistical Office of Estonia). 2001. ISBN 9985-74-202-8. Retrieved 2009-09-23. ^ Bureau, U.S. Census. "American FactFinder - Results". Factfinder2.census.gov. Retrieved 2017-08-20. ^ "About us". Londonsvenskar.com. LondonSwedes. Retrieved 2016-12-23. Approximately 100 000 Swedes live in London and the UK, with about 500 000 Swedish tourists visiting the UK capital annually. ^ "Fakta om Tyskland". Utlandsjobb.nu. Utlandsjobb.nu. Retrieved 2016-12-23. 23 000 svenskar bor i Tyskland. ^ "TablaPx". Ine.es. Retrieved 2017-08-20. ^ "915 (Svensk etymologisk ordbok)". Runeberg.org. 16 August 2017. Retrieved 2017-08-20. ^ "Population". History Learningsite. Retrieved 2008-05-24. ^ "Battle of Kircholm 1605". Kismeta.com. Retrieved 2010-08-25. ^ "Sweden's `Crazy' 500% Interest Rate; Fails to Faze Most Citizens, Businesses; Hike Seen as Short-Term Move to Protect Krona From Devaluation". Highbeam.com. 1992-09-18. Archived from the original on 2011-02-15. Retrieved 2010-08-03. ^ Jenny Stiernstedt. "Faktakoll: Rött ljus för Reinfeldt". Svd.se. Retrieved 2017-08-20. ^ "Yougov: Nu är SD Sveriges största parti". Metro.se. Retrieved 2017-08-20. ^ "Ethnologue report for Swedish". Retrieved 2009-02-09. gives the number of 8,789,835, but is based on data from 1986. Sweden has currently a population of 9.2 Mio (2008 census), and there are about 290,000 native speakers of Swedish in Finland "Statistics Finland - Population Structure". Retrieved 2009-02-09. (based on data from 2007), leading to an estimate of about 9 to 10 Mio. ^ a b "Haplogroups of the World" (PDF). Scs.uiuc.edu. Retrieved 2017-08-20.